Forty-one artists from around the world are participating in Marx@200, an exhibit that will run at SPACE gallery in downtown Pittsburgh through June 10. 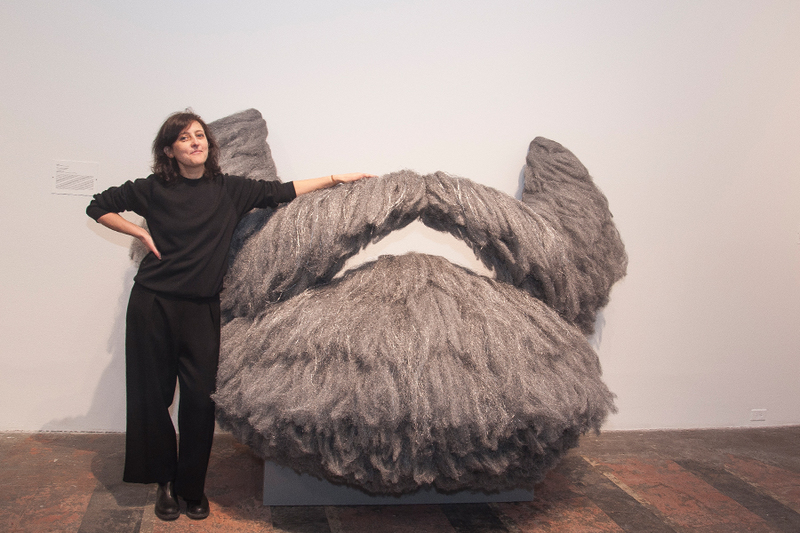 Curated by Carnegie Mellon University’s Kathy M. Newman, associate professor of English, and Susanne Slavick, the Andrew W. Mellon Professor of Art, the exhibition offers a contemporary exploration of the influence of Karl Marx and his ideas. The show coincides with this year’s bicentennial of Marx’s birth on May 5th and is also a response to a resurgence in Marx’s popularity worldwide. 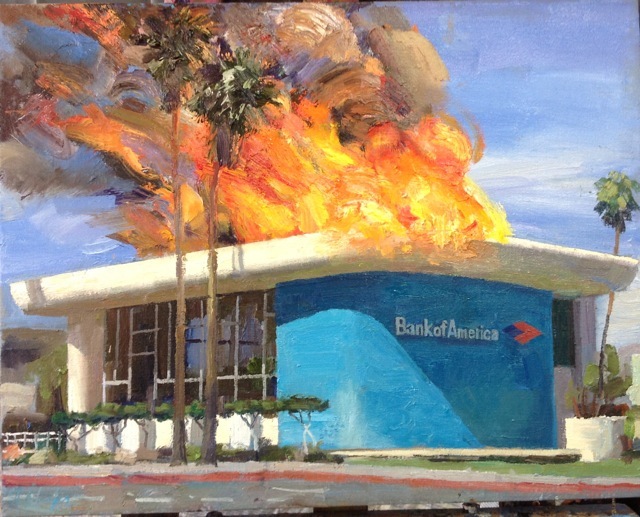 In preparatory research for the exhibit, Newman noticed that over the last 10 years artists have been turning to Marx as a way to understand the crises in capitalism produced by the global financial collapse of 2008. On April 6, more than 150 people attended the exhibition’s opening reception, including participating artists Slinko, Andrew Ellis Johnson, Imin Yeh, Jina Valentine, Tavia La Follette and Blake Fall-Conroy, who engineered a machine that cranks out pennies to demonstrate how long it takes to earn the hourly minimum wage in Pennsylvania. Because the art world reflects the inequities of the larger world—women and artists of color are chronically under-represented, Newman and Slavick purposefully sought balance. Of the 41 artists in the exhibit, 21 are women and more than a third are artists of color, both from the U.S. and around the world. “Marx is one of the major thinkers of the last 200 years. It is important to have all viewpoints. Regardless of one’s position on Marx, it is still helpful to have his philosophies presented to the community,” said Murray Horne, curator of the Pittsburgh Cultural Trust’s Wood Street Galleries. Johnson, a politically oriented artist and associate professor in CMU’s School of Art, has two pieces in the exhibition. 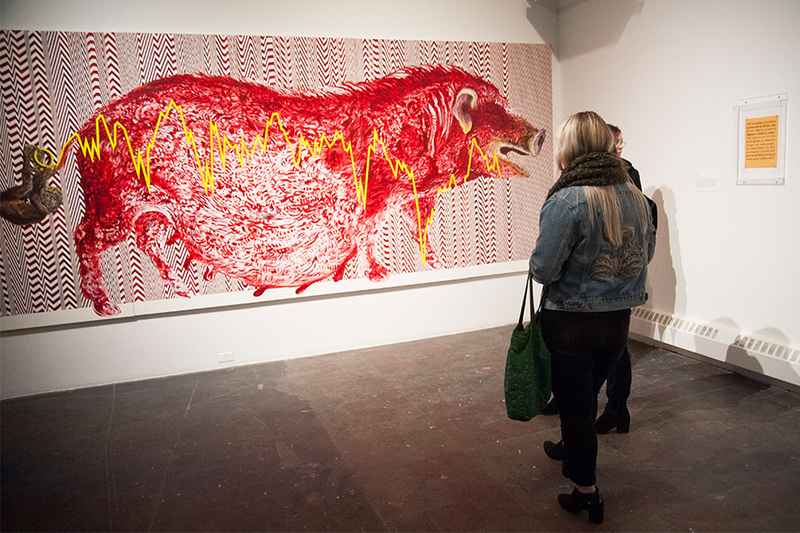 “Futures” is a painting of a bloated pig swinging future generations by its tail, reflecting the consequences of economic disasters and disparities. His sculpture “Union” merges and disempowers the iconic hammer and sickle in a meditation on the weakening of US labor unions in the 21st century. Johnson applauded the curators and gallery for taking on the challenge of providing a mainstream artistic outlet for Marx-related artwork. Newman, who had little curatorial experience prior to Marx@200, approached Slavick a year ago and asked for her help in developing the exhibit. Slavick, known for curating shows on politically volatile topics like guns and war, agreed. “Marx’s critical consciousness has become widespread, absorbed by both champions and detractors of capitalism. The rigor of his critique is both undeniable and necessary to better understand—and more optimistically, to transcend— the social and economic structures that govern us,” Slavick said. In addition to Newman, Slavick and Johnson, Marx@200 has several other CMU connections. It features work by Associate Professor of Art Paolo Pedercini, who developed the game “To Build a Better Mousetrap,” and Yeh, assistant professor of art who created “18 September 1867,” a facsimile of a rare signed first page of Marx’s “Das Kapital” that was auctioned for a record-breaking $313,809. CMU alumni works in the show include Lauren Frances Adams’ (MFA 2007) billboard “Nothing to Lose but Your Chains;” Michael Mallis’ (BFA 2008) animation “Natural Selection: The Rise of the Proletariat;” and Valentine’s (BHA 2001) “Memoranda (NYSE:GEO),” made with special ink that will eventually corrode the hand-lettered texts on both sides of her paper. It suggests how the Trump administration’s prison policies bleed into the fortunes of private prison companies. Newman and Slavick will host a program of brief remarks and activities to commemorate Karl Marx’s bicentennial in the SPACE gallery on Saturday, May 5 from 6-8:30 p.m. Andreea Ritivoi, head of CMU’s English Department, will make comments, along with David Shumway, director of CMU’s Humanities Center, which has supported Marx@200 events this year. Activities at the bicentennial will include a make-your-own Marx beard station, Karl Marx cookies and the auctioning of a set of action figures based on Marx, Mao, Lenin and Thoreau, all outfitted in hiking and camping gear and ready for adventure. Marx@200 is free and open to the public and will run through June 10 on Wednesdays and Thursdays from 11 a.m. – 6 p.m., Fridays and Saturdays from 11 a.m. – 8 p.m. and Sundays from 11 a.m. – 5 p.m. 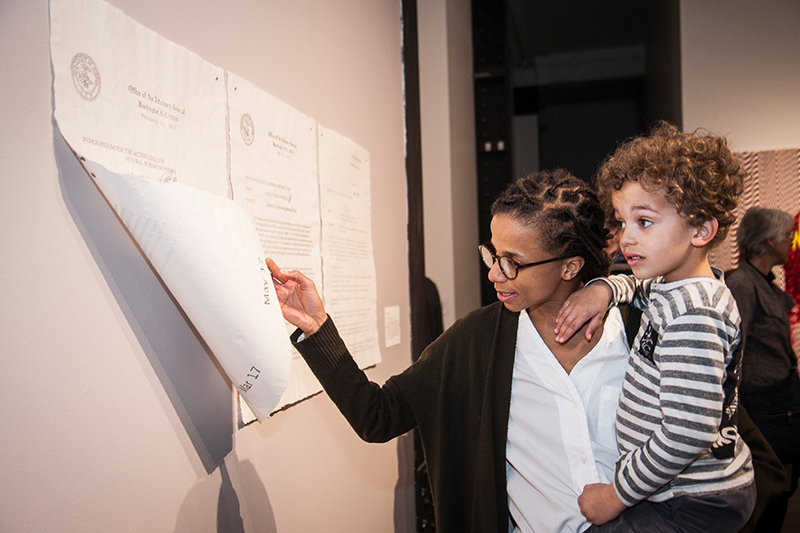 In addition to regular gallery hours, the exhibition will be open during the Cultural District Gallery Crawl on Friday, April 27 from 5:30-10 p.m.
Main story photo: Visitors to the Marx@200 exhibition view “Futures” by Andrew Ellis Johnson. 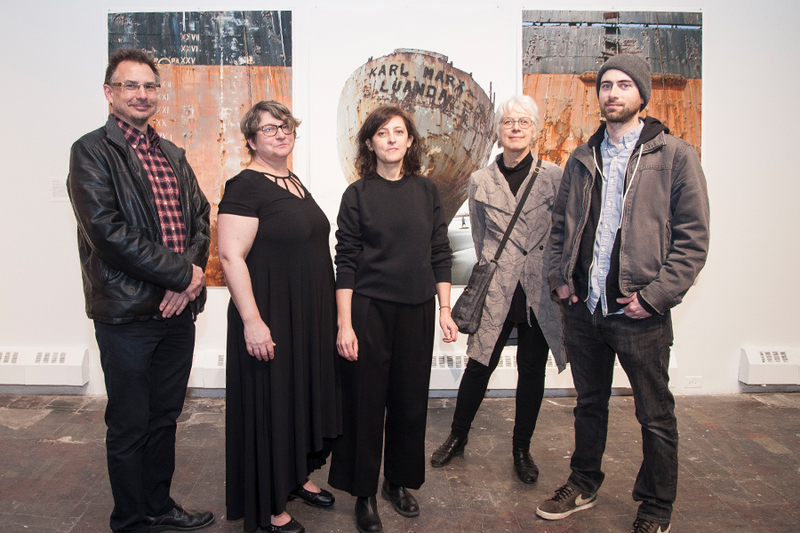 Second photo: Marx@200 curators Kathy Newman (second from left) and Susanne Slavick (second from right) with artists (from left to right), Andrew Ellis Johnson, Slinko and Blake Fall-Conroy in front of Kiluanji Kia Henda's "Karl Marx, Luanda."